Horror movies in the Seventies went through a kind of sea change. By the middle of the decade, Hammer were on their last legs having exhausted their Dracula and Frankenstein franchises, and the big Hollywood studios had yet to embrace the genre as fully as they could have, content to leave it to low budget production companies such as Amicus and Roger Corman’s New World Pictures. In Europe, horror movies were more concerned with providing sleaze than monsters, and further afield there were sporadic releases that rarely made an impact beyond their own borders. Zombie movies were still few and far between despite the success of George A. Romero’s Night of the Living Dead (1968), and movies where the protagonists were zombie Nazis were even rarer, with only The Frozen Dead (1966) predating the eerie chills of Shock Waves. 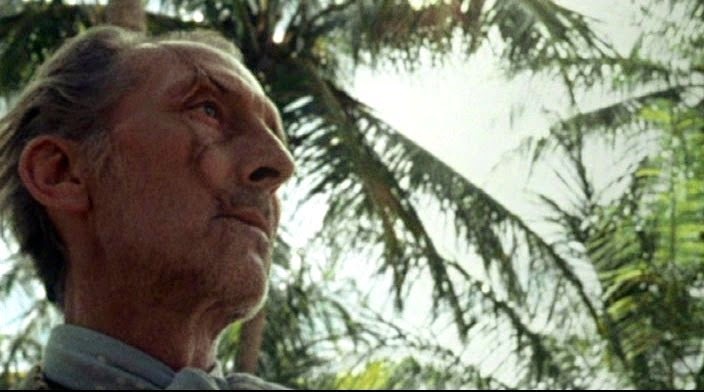 The movie begins in typical fashion, with a group of strangers on a chartered boat that’s seen better days, just like its crusty old captain, Ben (Carradine). The rest of his crew amounts to Keith (Halpin), who seems to be there just to steer the boat, and Dobbs (Stout), the booze-living galley hand. The passengers are a mixed bunch as well, consisting of middle-aged couple Norman and Beverly (Davidson, Sidney), and younger couple Chuck and Rose (Buch, Adams). Norman is already complaining about the age of the boat and the cost of the trip, but when the sky turns crimson and the boat’s instruments don’t respond, he really has something to complain about. An night-time encounter with a mysterious freighter leads to the boat needing repairs, but in the morning, Ben has disappeared. Believing he’s headed towards a nearby island, everyone gets in a dinghy and heads for shore. They find Ben but he’s dead. They also find a hotel, long abandoned – or so they think. Instead they find themselves challenged by a German-sounding stranger (Cushing). 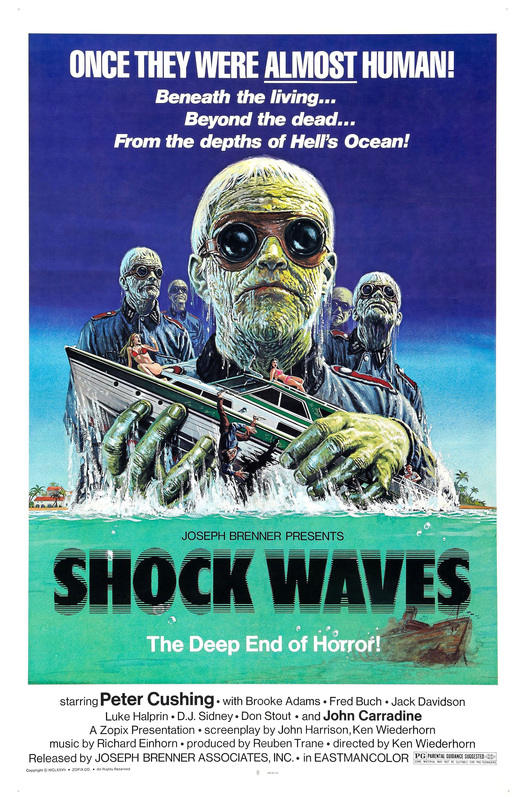 If it’s a gore-soaked, ripped-out entrails kind of zombie movie that you’re after, then be warned: Shock Waves is not the movie for you. In fact, this is possibly the first and only post-1968 zombie movie where not even a single drop of blood is spilt. Instead, director Wiederhorn (making his first feature), and co-writer John Kent Harrison concentrate on creating an unnerving, atmospheric chiller-thriller that does its best to be macabre rather than gory, and which largely succeeds in its aim. There’s something to be said for any horror movie that eschews blood and gore in its efforts to make viewers feel unnerved and uncomfortable, and though the movie suffers due to genre-standard scenes where the characters run from place to place without actually getting anywhere, the scenes that involve the implacable zombie Nazis have a certain frisson about them. At one point they emerge from the surf, one by one, and stand as if waiting for a signal only they can hear; it’s genuinely creepy. Wiederhorn is to be congratulated on being so constrained, and relying on menace and a febrile atmosphere to accentuate the occasional shocks. He’s helped by the choice of location, which isn’t an island at all, but several sites in Florida, including an area of swampland that the characters are forced to take flight and stumble through time and again as they try and escape, but though all that running about quite aimlessly seems to be just a way of padding out the running time, like all swampland, it has an unpleasant, threatening vibe that slowly makes itself felt the longer everyone crashes around it. Wiederhorn and DoP Reuben Trane do well to create such a hostile, potentially deadly environment… and that’s without the zombies. Also, there are times, notably at the beginning when the sky turns red, that the movie feels like it’s heading into full-on Twilight Zone territory, and these moments add to the growing sense of unease that the movie promotes in its opening half hour. But while there’s plenty of effective atmosphere to be had, the movie is less successful when it comes to its motley crew of characters. Cushing and Carradine are old hands at this sort of thing and manage their roles accordingly, while Adams, in her first leading role, has little to do but pose or swim in a bikini. Ex-Flipper star Halpin fares better as the nominal hero, but everyone else is saddled with the usual horror stereotypes: the long-suffering wife, the outwardly macho/inwardly cowardly adult jock, the self-important malcontent, and the booze-fuelled worrier. Once Ben is killed off the script disposes of the rest of the characters in predictable fashion (and order), without once attempting to make them more relatable. This, however, shouldn’t be much of a surprise, as creating likeable characters never seems to be a priority in horror movies, and Shock Waves is no different. But what is notable about it is that in the context of when it was released, it dared to be different in its approach and with its “monsters”. Many more zombie Nazi movies have followed in the years since, and some can be considered better movies overall, but with apologies to The Frozen Dead, this is the grandaddy of them all, and still as diverting and sinister as it was forty years ago.